Super bright LED bike light will keep you being seen clear in dark and increase safety during night cycling, and long working time makes it a normal flashlight for indoors and outdoors. Built-in rechargeable lithium battery, about 2 hours full charged and about 3-6 hours working time. 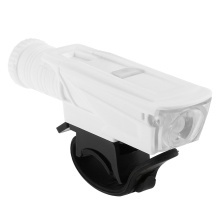 Super bright 150LM with 4 modes for different lighting demands: High, low, quick flash and SOS. Easy and quick mount on 20-31mm handlebar with an elastic clip band, and quick release design for convenient take down. Can be used as an emergency flashlight, small and lightweight for easy keep inside your car, basement or emergency kit. ABS construction durable and reliable for long time service.